Official August 2013 SWFL sales numbers have been posted from Florida Realtors and as expected the Fort Myers and Cape Coral real estate market is holding its own. 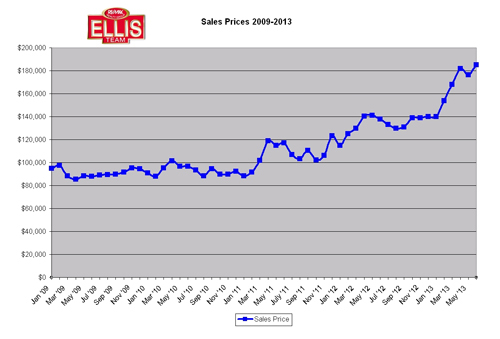 Listing inventory is down again and it’s causing prices to rise. In either event lower inventory and strong demand are pushing up home prices. Builders have reported strong sales this year and are filling in the gap as current demand is outpacing current supply. As prices rise and inventory dwindles look for building construction to pickup again this year. While building is taking the pressure off the resale market and should continue to do so moving forward, there is some risk in the construction industry. Building a home today takes approximately 6-9 months from contract to completion. Most builders require a down payment to begin construction. There are two ways to finance new construction. One is called an end loan and one is a construction/permanent loan. Today the most common is the end loan whereby the builder uses their own money to construct the home and the buyer obtains one loan at closing. The problem with an end loan today is there is no way to predict what interest rates will be 6-9 months from now. Rates have gone up over 1% in the past month or so and we expect them to rise again as the Fed curtails buying mortgage backed securities which has artificially kept rates low as the Fed has tried to stimulate the economy through lower interest rates. The Fed has announced on two separate occasions this summer their intention to stop this program once there is recovery in the economy, and we are seeing some mixed signs of recovery. Just when the Feds will kill this program has led the markets to speculate and bid up rates. Rates are determined by the value of the security. When the value is bid lower the return (or rate) goes up. 10 yr note buyers have been paying less than they were a few months ago due to volatility in the markets. The Fed has fired the warning shots over the bow and the markets have responded. We knew this day was coming, we just didn’t know when. With uncertainty in the interest rate market, it’s impossible for buyers to know how much more their borrowing costs will be next year when a house is completed. It can make the difference whether a buyer qualifies for the mortgage at all. The buyer may qualify today and not next year when the house is complete, so the builder is taking a big risk. A buyer doesn’t know how much they need to scale back today so they qualify next year. Imagine being a buyer and being told you qualify for a 3,000 sq ft home, however because rates are going up you need to scale back to a 2,500 sq ft home, or maybe even less. Perhaps you don’t like the 2,500 sq ft floor plan the builder is offering. You don’t want to sacrifice your lot location, or the pool you’ve chosen. What do you cut back on today, and how much? This is the dilemma buyers are faced with today. It is terribly expensive to lock in a rate longer than 45 days out, which most builder homes are going to be. This is pushing many buyers back to resale homes, and we have a shortage of inventory. It’s a double edged sword. If you’re a buyer paying cash you have more options and aren’t as concerned with rates. If you’re a buyer or seller needing to talk to a professional about your options, give us a call at 239-489-4042. We’ll be happy to help you sort out your options. Good luck and Happy Buying/Selling!!!! Posted in Southwest Florida Real Estate.Tagged August 2013 SWFL Sales Numbers, Cape Coral real estate market, Florida Realtors sales numbers, Fort Myers real estate prices, Median sale prices, Single family home listing inventory, Southwest Florida Real Estate Market Update.